To my knowledge no one has ever seen this...this is the first sighting of Elvis in the heavens. Elvis lives in the constellation Lacerta. The central star in this image is 8Lacerta. 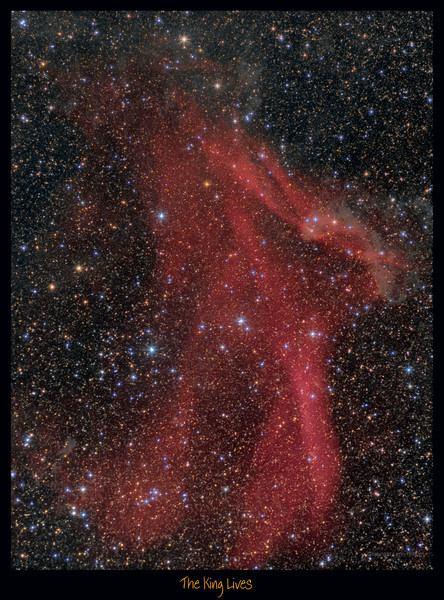 The red Ha (hydrogen alpha) object is known as Sh2-126. Image taken by Lynn Hilborn, WhistleStop Obs,Grafton,Ontario on August 28,31,Sept 02,03,2014. Taken with a Canon f2.8 200mm lens at f 3.5, FLI ML8300 camera at -30C, Tak NJP mount with Temma2, Baader filters. Total exposure time of over 12 hours ( Lum 26x10m, RGB 18x5m each, Ha 7x30m, all binned 1x1).